At Mares & Dow Construction, our goal is to provide our clients with a bathroom remodel that combines both a beautiful look and functional layout. Here are the basic necessities in making a bathroom comfortable and easier to keep clean. Good bathroom space is essential, always make sure there is enough room to use the fixtures easily. Safe is a major concern when using fixtures, especially around the tub and shower. The lavatory-sink should be nearest the door. Private fixtures like the tub & toilet should be farthest from the door. Always try to insulate all the walls and install a quality door to deafen sound. If possible isolate toilets or tubs with their own doors. This makes it possible to share a bathroom during those rush times and still have privacy. Windows and skylights allow bathrooms to be small and still feel comfortable. Placement of windows is sometimes real important in order to keep privacy within the home. 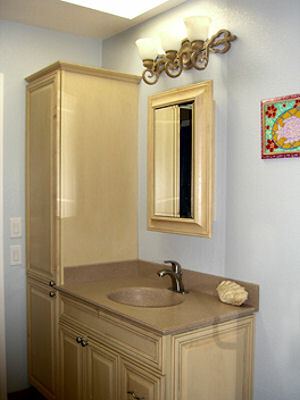 Always try to have overhead lighting and wall lighting in order to have the proper lighting in the mirror. Always choose comfortable and safe cabinet heights, so one is not stooping or standing on tiptoes. Shower stalls should be large enough to dry off in. Try to invest in well made shower valves, lavatory faucets, towel bars, mirrors, and all the accessories, they will last longer. Tile and resilient flooring are best in bathrooms. Ventilate! Try to always install an exhaust fan in the ceiling in order to control moisture in the bathroom. And always provide GFCI protection on all bathroom outlets.